I was mooching around the Plaza and happened to see a fairly narrow exit up some steps, I had an obligatory nose and at the top saw a delightful looking compact hotel that beckoned me upwards and inwards. The delight grew, a tiny reception area and lovely old wooden doors opened onto a galleried patio complete with Andalusian fountain. I stopped for coffee and checked out the toilets, which were a bit too ultra-modern and not really in keeping but nevertheless spotless and different. The restaurant caught my attention, complete with bar, and its own entrance. Sectioned into smaller dining areas to give more privacy it shouted – ´eat here.´ I had to return. 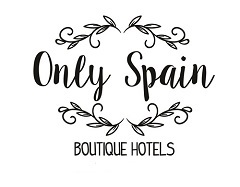 For me there is no other alternative hotel so charming, central and as typically Andalusian as this for exploring the city Guadix, famous for it´s cave dwellers and ceramics you´ll happily occupy a day or two here while enjoying your stay in Hotel Abentofail. Or book Hotel Abentofail immediately via Booking dot com. Have you visited a great hotel in or around Granada that you’d like to recommend?